For additional information about this book, visit the website JASCIH.com. 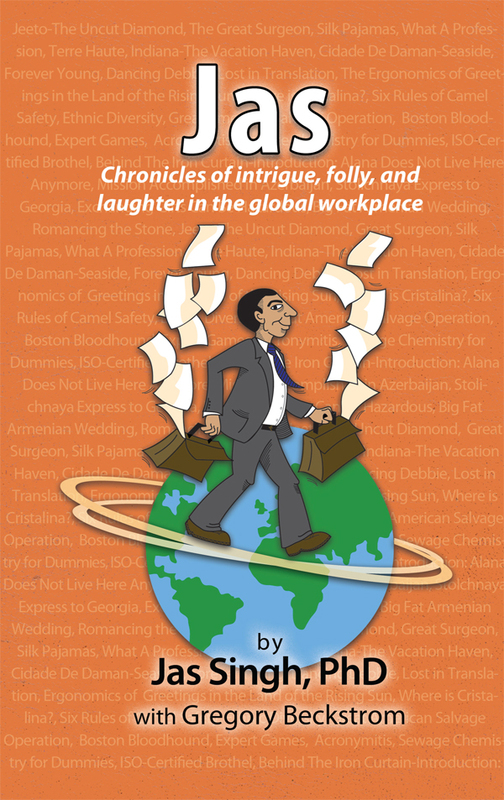 Travel, humor, romance, diverse cultures, and a fascinating career – Jas is a memoir unlike any other. Jeeto - The Uncut Diamond – A story about a rustic, uneducated, and beautiful village girl who dreams of marrying a college graduate and going to America. Instead, she marries a man three times her age in the next village. It is a familiar story for many Indian women. Silk Pajamas – Shanghai hotel lounge hostesses will go out of their way to make travel-weary foreigners feel welcome. But be wary of offers for assistance with personal shopping. Alana Does Not Live Here Anymore – Delivering precious gifts to a Jewish family in the darkness of a Moscow apartment complex in the early 1980s is risky business. Probably a good idea to keep the taxi engine running! Romancing the Stone – Twenty-five American scientists and engineers on a state-controlled tour of five Russian cities and technical institutions. One month of interaction with the Americans results in profound behavior changes of the KGB tour guides. Boston Bloodhound – Bloated bags and chemical refineries along a Baton Rouge highway are cherished attractions to a unique and brilliant scientist. But does Katrina appreciate the results? Terre Haute, Indiana – Herb Mossner is a quick witted super-nerd with irreverence for just about everything. With Herb, nerdiness is chic. Six Basic Rules of Camel Safety – Rule No. 6 – Never tether a male camel within eyesight of a female camel during the winter. As Jas describes in his book, the profession of industrial hygiene can be very rewarding, measured by the lives we save and people we meet along the way. The book provides a unique look into the life of a dedicated professional who continues to master the technical field of industrial hygiene while at the same time enjoys life, has fun and does not miss an opportunity to experience the humanity we are dedicated to protect. Jas’s stories relate technical terms in a light and endearing text. He is passionate about his profession. This book transcends cultural boundaries and will encourage many young readers to consider the industrial hygiene profession. Very enjoyable reading. Thank you for sharing. What great stories! Thank you for sharing them. I have never laughed so loud as I did reading the story Six Basic Rules of Camel Safety. Very funny! Thank you for lightening my morning with this great story. What interesting experiences you have had! Thanks for taking the time to share them with us. I enjoy your stories (even when they don’t involve me). I could have used the instructions in Six Basic Rules of Camel Safety prior to my own attempt to ride a camel. The guide warned me to hang on, but my Arabic was pretty rusty so I understood nothing. It never occurred to me that the beast would rise up from his back legs first. It was quite a surprise. What interesting stories! Kudos to you! And I will remember Rule No. 6 – Never tether a male camel within eye sight of a female camel in the winter. Dr. Singh is a board-certified industrial hygienist whose implausible journey from a dusty village in India to the height of the health & safety consulting profession is a story of inspiration, sadness, intrigue, and wonder. The chronicles of his expe­riences is a remarkable reflection of life experienced through two extreme lenses. He excelled in school, was encouraged by his family to do his best, worked hard, received an excellent education, built businesses, and has shared his knowledge with many people in his global network.